Looking for a cheap (if quick) gondola ride? Take a traghetto across the Grand Canal. ABOVE: A traghetto ferries passengers across the Grand Canal. INSET BELOW: A Venetian mother and her daughter (wearing inline skates) wait to board. Head for the nearest traghetto pier and get rowed to the other side. As a tourist, you'll be expected to pay €2,-- (nearly three times the resident rate of 70 cents), but there is a workaround for frequent visitors: See our "money-saving tip" below. Traghetto (plural: traghetti) means "ferry" in Italian. On Venice's Grand Canal, traghetti are the passenger boats that cross the canal at seven points between the railroad station and St. Mark's Basin. The boats are large gondolas without bow decoration, brocaded chairs, and other luxury trimmings. They are rowed by two oarsmen: one who stands behind the passengers like a traditional gondolier, the other closer to the bow. Note: Traghetto routes are clearly marked on some Venice street maps (look for straight lines across the Grand Canal), and you'll often see signs on buildings pointing toward the traghetto landings when you're walking through neighborhoods along the Grand Canal. 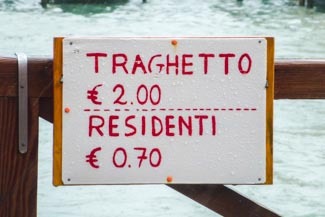 ABOVE: A sign at a traghetto pier shows the two-tiered pricing scheme that went into effect in 2013. Follow the "Traghetto" signs to the nearest landing, which will be a small wooden pier along the edge of the Grand Canal. Boats normally shuttle back and forth almost continuously, so you shouldn't have to wait long if the service is running. Hand your fare to the oarsman as you board or leave the boat. If you don't have exact change, try to pay with coins instead of banknotes. Money-saving tip: If you've applied for and bought the VeneziaUnica Pass for Frequent Users, show the card, which entitles you to pay the local residents' fare of 70 cents instead of tourist price of €2. Don't try to board a traghetto in a wheelchair, with a baby carriage, or with heavy luggage. Instead, use the No. 1 vaporetto, which has a flat deck and is fully accessible. Hours of traghetto service are unpredictable at best. 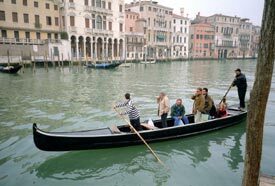 When they're operating, the boats are usually rowed back and forth across the Grand Canal from early in the morning until 7 or 8 p.m., or possibly a bit later in the summer (sometimes with a break for lunch). If you arrive at a traghetto platform and no boat is in sight, just do as the Venetians do and either take the vaporetto or save money by walking to the nearest bridge across the Grand Canal.